The holly plant is one of the plants most commonly associated with Christmas. Although the mention of holly today conjures images of Christmas plants, wreaths and berries, holly was already commonly used as a decorative plant and the subject of myths, legends, and customary observances long before the celebration of Christmas was introduced. To the Druids, the wisest members of ancient Celtic society, it was holly's evergreen nature which made it so special. They believed that it stayed green, with its red berries, to help keep the earth beautiful when the deciduous trees (for example the oak trees, which they also held sacred) shed their leaves. The Druids would wear Holly in their hair when venturing into the forests to watch the priests collecting mistletoe. The holly berries were thought to represent the sacred blood of their Goddess. For many Pagan religions, it was customary to place holly leaves and branches around the outside of their home during winter. This was intended as a kindly and hospitable gesture. In addition, they believed that tiny fairies from the forests could come into their homes and use the holly as shelter against the cold. In a way, this may have some connection with actual scientific fact, as wild holly is sometimes used as shelter by small animals. The ancient Romans used the plant to decorate their houses, temples, and deities for Saturnalia, the mid-winter feast of December 12th in honor of the Sun God Saturn . They exchanged holly as a symbol of kindness and friendship. According to Pliny the Elder, a Roman nobleman, natural historian and scientist born 23 AD who died during the 79 AD eruption of Mount Vesuvius,.holly flowers had the ability to turn water to ice. Get your very own holly plant and pick all the sprigs of real holly that you'll need. 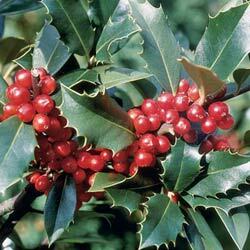 The Christmas Holly is an attractive evergreen plant with lush, glossy deep green leaves, and brilliant red berries. It will give you years of enjoyment and beauty in your garden. The plant is hardy and will thrive under most Northern conditions. It can be trimmed as a bushy plant or used as an attractive evergreen hedge. While other Romans continued with pagan worship, Christians celebrated the birth of Jesus Christ. The early Christians adopted the tradition of decorating their home with holly. As Christians increased in number and their customs prevailed, Holly lost its pagan associations and became a symbol of Christmas, with the sharply pointed leaves symbolising the crown of thorns which jesus was made to wear prior to his crucifixion, and the berries becoming a symbol of the blood of Christ. Some refer to Holly as the Holy Tree and claim that it grew in Christ's footsteps. The white flowers represent Jesus's purity and birth, and the bitter bark is said to represent the passion. Some writers hold that holly was actually the plant which did actually form the crown of thorns and that the berries were originally white before being stained by Christ's blood. In modern times, the use of Holly as a Christmas plant is a symbol of good luck, peace and joy. It decorates the home at Christmas time, and is also a symbol of delight, celebration and good cheer. It is believed that a sprig of holly placed on a bedpost will bring sweet dreams Some still believe that a holly plant outside your house will protect the inhabitants from lightning, and will frighten off or capture witches, goblins and evil spirits before they can enter your home..
A holly plant is eye-catching all year round but paticularly in the middle of winter when many other plants have bare branches. So as you're decorating your house with the holly plants featured on this page, think a little about the roots of this tradition. As well as making your home look festive, you may also be protecting your home, and in the process, could be providing shelter to a few forest fairies too. Please bookmark Piglette for all your future flowers and plants for all occasions including roses plus many unique and unusual gifts at great prices.